Ideal for the continuous treatment of airborne odors, AirRelief3001 is an extended release innovation that combines the powerful properties of chlorine dioxide with a unique canister design. This product is designed to oxidize smoke, pet, and other odors at the source. By simply adding about 4 fl. oz. (120 ml) of room temperature water to the contents of the packet inside the canister and allowing 5 minutes of reaction time, an adjustable, vented cap allows the canister to emit as much vapor as necessary to deodorize the environment. The gel-like substance created by this combination is designed to remain effective for up to 30 days. 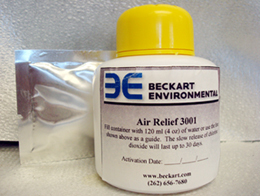 AirRelief3001 rounds out a complete family of chlorine dioxide products offered by Beckart Environmental, including Aqua-Tabs for the creation of chlorine dioxide liquid or gas when mixed with water, our kit products that allow for generating larger quantities of chlorine dioxide without a generator. canister to emit an odor-oxidizing vapor on an as-needed basis.